Three UK tourists in Vietnam who plunged 50ft (15m) over a waterfall to their deaths were not properly warned of the dangers, a coroner has ruled. 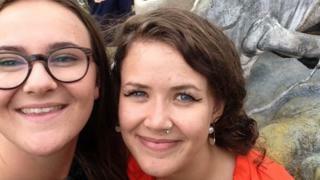 Sisters Izzy Squire, 19, and Beth Anderson, 24, of Sheffield, died along with friend Christian Sloan, 24, of Kent, at Datanla in February 2016. They had slid down a natural water slide into a pool where they were meant to climb out. But the coroner ruled the local guide had not adequately explained this. The families said the deaths were "wholly preventable". The coroner, Chris Dorries, heard how the three friends had worn life jackets and helmets as they slid head first down the water slide before ending up in a 6ft deep pool. But, instead of getting out, the trio continued into the next tier of the river complex and died when they went over the waterfall. The inquest heard how their guide, Dang Van Si, said he warned them about how to get out of the pool safely. However, a range of witnesses, who were found through a Facebook appeal by Mr Sloan's family, contradicted this. On Tuesday, Mr Dorries said he did not accept the guide's account and ruled that he had either not given a warning at all or not ensured it was properly understood. Speaking after the inquest the father of Ms Squire and Ms Anderson, David Squire, said he did not know how the criminal investigation into the deaths was progressing in Vietnam. Mr Squire said: "To be clear, the events and circumstances that led to their deaths were wholly preventable." Giving a narrative conclusion, Mr Dorries said: "They were not adequately warned of the risks to be found at the bottom of the slide and, in particular, that there was a potentially lethal hazard of a further waterfall which they could be swept in from only 14 metres further on." Mr Dorries said that, contrary to reports at the time, the three travellers had done nothing to compromise their own safety.